The first move we will discuss is the reveal. What the reveal does is uncovers something in your scene. To do this move, find a foreground element that can hide something in the middle ground or the background. For example in the clip above, I have the foreground trees hiding the sea of fog that is covering the valley. So like the example above it could be trees hiding a sea of fog, or a hill hiding the sun as it rises. To start, select what will be revealed then find a foreground element to hide your selection. Now carefully move past that foreground element to reveal what’s hiding behind it. The reveal can be an interesting way to create layers in your scene because it immediately establishes a foreground, a middle ground and a background. Having these three overlapping layers work together to provide a sense of depth, scale and complexity, which results in creating a visually interesting scene for your viewer. After you master the simple reveal drone shot, try to mix things up with this move by attempting it while ascending up, or descending down. You can also try doing it in reverse by moving backward to reveal the foreground instead. The next move you should master is the tilt reveal. This is the one move I always do when I get to a location… which is probably because it reminds me of all those epic sweeping shots we are so used to seeing in the movies. To do the tilt reveal, point your camera down, then begin your move while slowly move your camera’s gimbal up to reveal a landscape. I like the tilt reveal because it starts off by creating some mystery for the viewer. This is the important “why” behind why this shot works. This can make the viewer curious as to what they are looking at, which can leave them wondering, where are we? Or what’s coming next? That then is a way to draw in your viewer… eventually leading them to the answer to their question which is your big reveal. These types of shots work great as an establishing shot because they give your viewers some context to where a scene is taking place. This is why many times you see this type of shot at the beginning of those epic blockbuster movies during the opening credits or when the camera cuts to a new scene/location. So with that in mind, it’s a good idea to use this sparingly. After you master the tilt reveal drone shot, try doing it in reverse, or try descending down, or ascending up while tilting the camera towards your subject for added dynamic effect. Next up is the top down shot. To do this you just need to point your camera down, then have your drone hover steadily in place, or fly in a straight or diagonal line. While this sounds very simple and obvious, the key is moving your drone in a smooth manner. So try to fly as straight as possible to avoid any accidental drifting. Next, make sure you select a great subject that is moving or that has movement around it. Otherwise, this shot can get a bit boring fast. For subjects look for a car driving, a person running or even compelling patterns like from a river. People are easily able to understand the perspective of an image when it contains both the land and sky. So doing a top down shot that includes no sky can instantly make your videos unique and interesting. This shot also creates visual interest because it forces your viewer to take a moment to decipher exactly what they are looking at since the angle is so unique and typical land references (ground, sky, sun, etc…) are removed. Once your viewer understands what they are looking at they should then be surprised to see your subject matter in a new way. The top down looks best when your moves are steady. After you master the top down drone shot try doing it while ascending up, or descending down for added effect. The next move I call the orbit. I should state up front that the orbit can be tough to do so you will need to practice this in a big open area. To do the orbit, you just need to fly around your subject while rotating the drone at the same time. The key though is to keep the camera so that it always faces the subject. Just like drawing smooth circles freehand, this is hard to do. The key is to get some movement first with the drone and then slightly move the sticks and try to keep the pressure steady. These orbital drone movements can be visually interesting because you have layers that are constantly overlapping, blending, and changing in perspective. This move essentially creates an “arcing reveal”. The effect creates contrast and draws the viewer in because the scene is constantly being observed from a new rapidly changing angle. For best results, it’s best to keep the drone moving smoothly and consistently throughout the entire move. After you master the orbit drone shot, try doing it while ascending up or descending down or push towards or pull away from your subject to create an even more dynamic effect. The last shot is a more advanced move I call the tilt while tracking shot. To do this move, point your camera at a subject while making sure your drone is clearly above it (otherwise you might get tripped out and think you are going to hit it). Then fly towards that subject while tilting your camera down. The key is to fly as straight as possible without having any drift. This can be hard since you are having to keep track of multiple settings. These shots work best when you keep the subject lined up in the frame the entire time as you fly completely over it. This shot can be seriously compelling because the image planes dramatically shift over each other, creating something similar-ish to Alfred Hitchcock’s vertigo effect. Hitchcock’s vertigo effect is known for creating a confounding, emotional impact so that is what I mean when I reference it. See the video above, it’s much better seen than explained. For best results, fly the drone straight at a steady speed, and try to match the camera’s tilting speed so that the camera fully tilts down once you are right over your subject. If you do this right the gimbal will reach it’s limit and probably do a jarring shake letting you know it can’t tilt any further but I just cut right before that happens when I’m editing my videos. After you master the tilt while tracking drone shot, try doing it while ascending up, or descending down, or try doing it in reverse to create a tilt while tracking reveal effect inside. I want to encourage you to practice mastering these moves multiple times with all types of subjects. 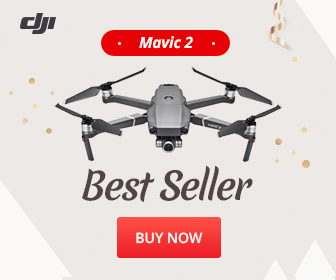 Once you master these drone shots you are well on your way to creating more professional and compelling aerial footage like the kind we are used to seeing in the movies. Also don’t be afraid to try two or more cinematic drone moves at once. Dirk Dallas, also known online as @dirka, is the founder and curator of From Where I Drone, a website dedicated to inspiring and teaching drone pilots how to create better aerial photos and videos.